The Leprechaun is an Irish fairy. He looks like a small, old man (about 2 feet tall), often dressed like a shoemaker, with a cocked hat and a leather apron. According to legend, leprechauns are aloof and unfriendly, live alone, and pass the time making shoes. They also possess a hidden pot of gold. Treasure hunters can often track down a leprechaun by the sound of his shoemaker's hammer. If caught, he can be forced (with the threat of bodily violence) to reveal the whereabouts of his treasure, but the captor must keep their eyes on him every second. If the captor's eyes leave the leprechaun (and he often tricks them into looking away), he vanishes and all hopes of finding the treasure are lost. Patrick was born in Scotland. His father was Calpurnius, a local official. Patrick waskidnapped by Irish raiders and spent 6 years in slavery. After getting a message from God in a dream, he escaped to Britain. It said that he was reunited with his family, and then went to the monastery and studied under St. Germain, bishop of Auxerre. During his training he became aware that his calling was to convert the pagans to Christianity. The best known passage in the Confessio, his spiritual autobiography, tells of a dream after his return to Britain in which one Victoricus delivered him a letter headed "The Voice of the Irish." As he read it he seemed to hear a certain company of Irish begging him to walk once more among them. "Deeply moved," he said, "I could read no more." He was ordained as a deacon, then priest and finally as a bishop. Pope Celestine sent him back to Ireland to preach the gospel. Evidently he was a great traveller, especially in Celtic countries, as innumerable places in Brittany, Cornwall, Wales, Scotland and Ireland are named after him. Patrick is most known the world over for having driven the snakes from Ireland. Different tales tell of his standing upon a hill, using a wooden staffto drive the serpents into the sea, banishing them forever from the shoresof Ireland. While it is true there are no snakes in Ireland, chances are that there never have been since the time the island was seperated from the rest of the continent at the end of the ice age. As in many old pagan religions serpent symbols were common, and possibly even worshipped. Driving the snakes from Ireland was probably symbolic of putting an end to that pagan practice. While not the first to bring Christianity to Ireland, it was Patrick who encountered the Druids at Tara and abolished their pagan rights. He converted the warrior chiefs and princes, baptizing them and thousands of their subjects in the Holy Wells which still bear that name. According to tradition St. Patrick died in A.D. 493 and was buried in the same grave as St. Bridget and St. Columba, at Downpatrick, County Down. The jawbone of St. Patrick was preserved in a silver shrine and was often requested in times of childbirth, epileptic fits and as a preservative against the evil eye. 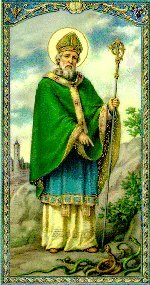 Another legend says St. Patrick ended his days at Glastonbury and was buried there. The Chapel of St. Patrick still exists as part of Galstonbury Abbey. Though originally a Catholic holy day, St. Patrick's Day has evolved into more of a secular holiday.